K-Dyne is a North American company who provides pressure pilots and relay equipment suited for production control systems. 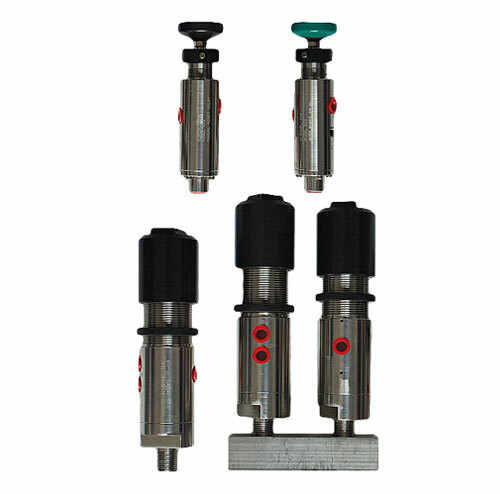 The P40 pressure pilots function as a three way block and bleed valve, which can be configured to respond to increasing and decreasing process pressures. The piston design has three sensing diameters to meet desired pressure ranges. The spring pressure operates from 10-10,000 psi. R11 manual and automatic relay systems operate as a compact operating instrument valve which is well suited for production control systems. The R11 is ideal for field mounting on pressure sensors, actuators and other control units. K-Dyne Manifolds act as an interface with high and low pressure switches, these units are made with 316 stainless steel. Give us a call at 1 (780) 463-6366, or fill out the form below and we will contact you! © 2015 McMath Controls & Automation. All rights reserved.